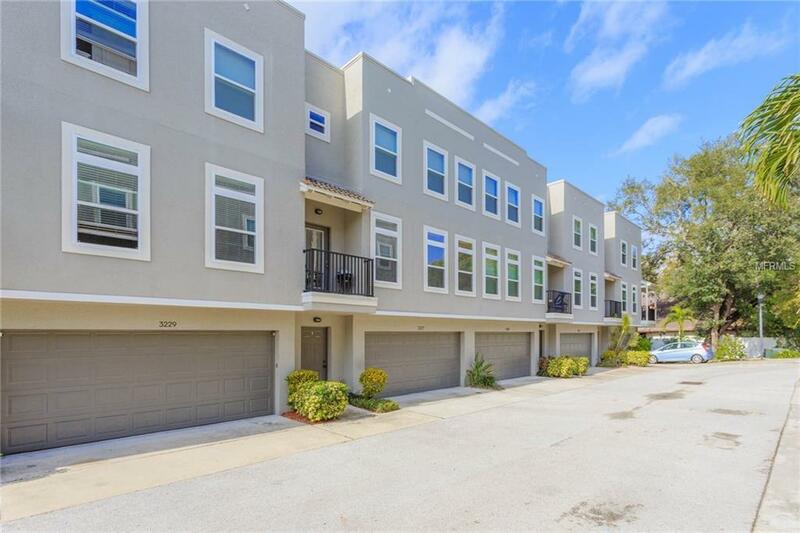 Stunning 3-bedroom, 3.5 bath, 2-car garage townhome situated in desirable south Tampa. Enter into this 1928 square foot home with a beautiful wooden staircase leading to the open floorplan living space with wood floors and abundant natural light from 3 large hurricane windows (2014). Attention to detail is evident in the trim work and crown molding on the high ceilings and private balcony. The kitchen boasts plenty of cabinetry, granite countertops, stainless steel appliances, undermount sink, and recessed lighting. Roomy Master has ensuite with beautiful walk in shower with glass door and double sink vanity. Second bedroom with designated bathroom is perfect for family or guests. All bedrooms have custom closets and 2 additional closets for storage. Excellent location in the best school districts, (Mitchell elementary, Wilson Middle and Plant high school) convenient to shopping, restaurants, and Tampa Airport. Well established community with low association fees and private community pool. Indoor laundry, blinds, ceiling fans and all appliances can be included. Nothing left to do but move in. Schedule to see soon -this wont last long.